Geometrically chiral plasmonic nanostructures lead to chiroptical far-field responses much stronger than those of natural chiral molecules. These signals, however, are unwanted for chiral plasmonic near-field sources, where the circular dichroism response of a chiral analyte should be enhanced. 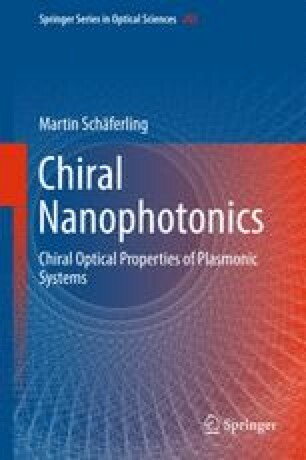 In this chapter, we introduce the concept of plasmonic racemates, which combine the strong chiral near-field response of chiral nanostructures with the zero chiroptical far-field response of achiral systems. We show that such racemates provide enantiomorphic fields under enantiomorphic illumination, which is important for straightforward spectroscopy schemes. Additionally, we discuss how to create locally chiral plasmonic lattices, which are achiral periodic arrangements of simple building blocks that build chiral substructures locally. By this means, such lattices are plasmonic racemates with a very high packing density.